Earlier this week, Google announced its intent to acquire Motorola Mobility. And on August 15th, this intent became a reality when Google acquired Motorola Mobility for $12.5 billion, the largest acquisition in company history. Why is this acquisition so significant? So how does one of the most successful companies in the world celebrate a great business success? An Elegant Dinner Party? Not even close. A Game of Ping-Pong? OF COURSE. That’s right. 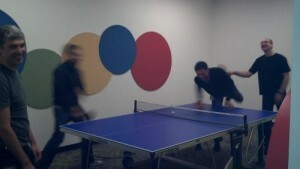 After Google and Motorola made a landmark business decision, they decided to celebrate with a game of ping-pong. In the picture at the top of the page, you can see Andy Rubin of Google, Sanjay Jha, CEO of Motorolla, and others enjoying a game of ping-pong at Google’s headquarters. Oh how so many of us envy the casual and graceful nature with which Google conducts its business. © WCPP 2010. All rights reserved.